The aronia berry, also known as chokeberry, is chock full of beneficial nutrients proven to have strong health benefits. The berry also adds unique flavor to vegetarian cooking. Despite its many benefits, the aronia berry's popularity lags behind other berries such as blueberries or raspberries. Read on to learn more about this versatile super fruit and how to incorporate it into your diet and healthy lifestyle. Aronia berries come from shrubs that are native to eastern North America, although the shrubs are now grown commercially throughout the United States, Russia and Eastern Europe. The shrubs produce small, round fruits that are deep red to purple-black in color and look similar to a blueberry. You can purchase aronia berries commercially, although it may be challenging to find fresh berries at your local supermarket. Instead, you're more likely to find them frozen. To find fresh berries, you may need to visit your local natural health food store. Your local farmer's market may also feature aronia berries. If you have a green thumb, you can grow aronia shrubs yourself. The shrubs grow well in a variety of zones and enjoy damp areas. Keep in mind, the shrubs grow up to eight feet tall so allow them plenty of room. Aronia berries get their dark purplish color from their anthocyanin content. Anthocyanins are antioxidants proven to help protect cells and reduce inflammation. In fact, according to the National Institutes of Health, anthoycyanins are "strongly linked to oxidative stress protection and have also been shown to reduce cancer cell production and inhibit tumors." WebMD reports that in a study of anthocyanin content among purple berries, chokeberry had the highest total anthocyanin content among the berries studied and berries in general. They also had the highest antioxidant capacity. Aronia berries are also high in iron, vitamin C, dietary fiber and quinic acid. Quinic acid is one of the antibacterial substances found in cranberries that make that fruit a great remedy for urinary tract infections. Aronia berries contain extremely high levels of quinic acid. According to a PubMed abstract, aronia extract reduces high blood pressure, lipid, oxidative stress markers and serum endothelin levels in people with metabolic syndrome. There are no known side effects of aronia berries. However, as with many berries, they may have a natural laxative effect when eaten in excess. Although aronia berries can be consumed safely straight from the bush, they earned the nickname 'chokeberry' for good reason. They have a very astringent, strong taste that many people can't tolerate when eaten plain. But when you incorporate the healthy berries into your cooking, they add nice flavor to dishes. Because of their unique taste, you'll want to experiment to find recipes that suit your tastes. Create an aronia berry sauce and use it to top cakes or frozen desserts. 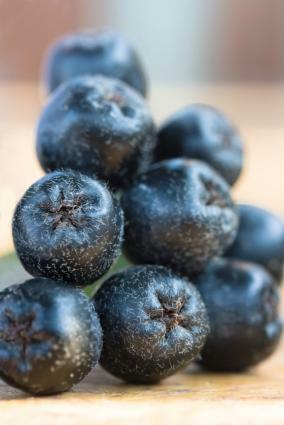 Substitute aronia berries for blueberries in your favorite muffin or bread recipe. Mix aronia berries into yogurt or Kefir. Top oatmeal, cereal or salads with the berries. Add the berries to a smoothie. Make an aronia vinaigrette to dress greens; a vinaigrette recipe won the Midwest Aronia Association/Iowa State University Aronia Recipe Contest. To add a kick to grilled vegetables, try an Aronia Berry Bourbon BBQ Sauce recipe. The tiny aronia berry is proving to be a super fruit that stands out from the crowd. It's easy to grow, versatile and packs an impressive nutrition punch. While it's most often seen in juice, as word gets out about this fruity powerhouse, it's sure to become a household staple.